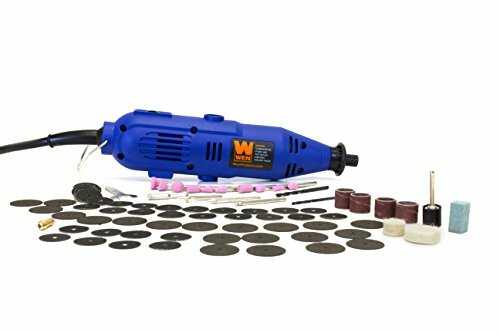 GOXAWEE Electric Rotary Tool kit is 100% brand new & high quality. 5 Step Variable Speed: Speed changing from 8,000 to 30,000 rpm for a different situation to adapt to the target. 3 Jaw Keyless Drill Chuck: The GOXAWEE multi chuck has High stability & allows you to quickly and easily change accessories without tool & accepts accessories from 0.3 mm to 3.2 mm shank. Flex Shaft Attachment: Reduces vibration to prevent fatigue and gives a better grip for greater maneuverability. 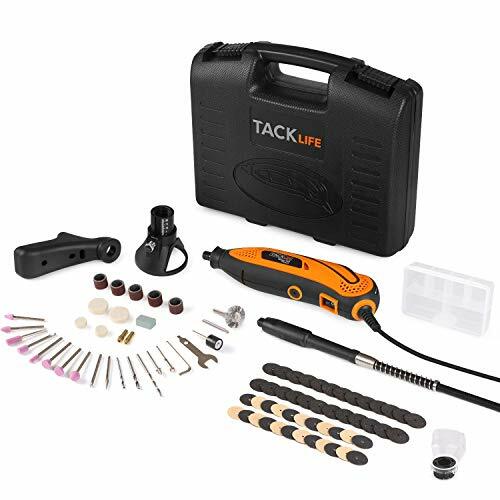 One for All Accessories Kit: Allows you to tackle almost any DIY work that you want & All the accessories are compatible with most rotary tools, drill tools or die grinders, such as Dremel. Wide Application: Ideal for various Around-the-House, workshop, jobsite and crafting projects. Great for DIY'ers, craft workers, Jewellery cleaning/polishing, model enthusiasts and sculptors. With GOXAWEE Rotary Tool, the possibilities are endless, limited only by your imagination & federal law. Try our best to make the job easier & it is a nice DIY gift for you or your friends. GOXAWEE Tool is the source for hard-to-find mini tools for DIY crafts and hobbies. We take great pride in providing the best customer service in North America. 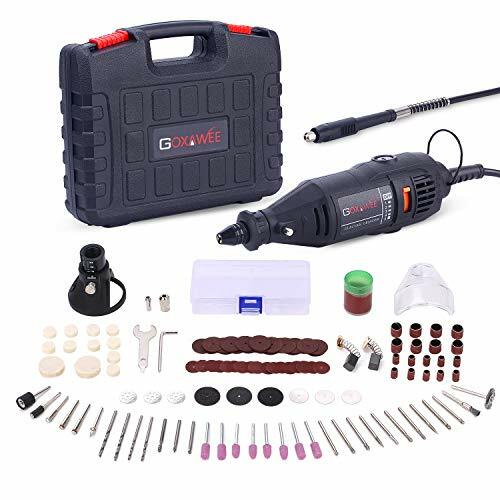 Whether you are a professional craftsman, a robot builder, or a model building hobbyist who requires precision small tools and micro tools, GOXAWEE Tool can help. Quick Change Drill Chuck - Come with 3 Jaw Universal Chuck applying better stability on your projects, allows you to quickly and easily change accessories on Rotary machine tool freely. GOXAWEE Multi Chuck accepts accessories from 1/64" to 1/8" shank, wider compatible than others. Ideal when the application requires numerous accessory changes. 140pcs Attachment & Accessory - Flexible Shaft holds like a pen for your precise projects. Cover Shield provide better protection for cutting and grinding. Drill Locator helps for precision work on wood. Diamond Cutting Wheel is the best tips for glass, ceramic, floor tile etc. Versatile accessories include a pair of extra carbon brush, rescue you from searching new set and saving money. Variable Speed & Compact - Variable speed dial is easy to use. The Variable Speed Adjustment Knob showing 5 Step Speeds from 8,000 to 30,000 RPM. By adjusting the speed you can make delicate engravings on wood, glass, metals, plastics, tile and other materials with control easily. 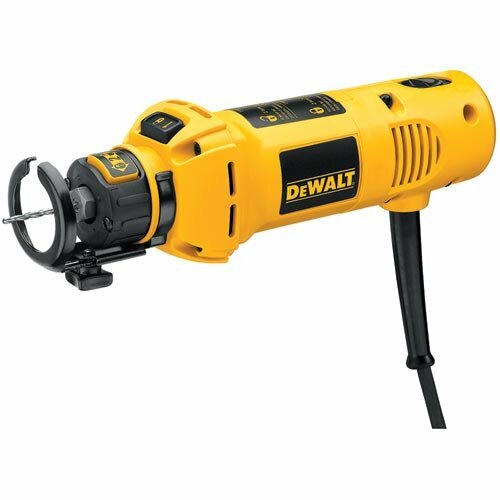 Its ergonomic compact rotary tool design makes it handhold size, lightweight, not make the loud noise. 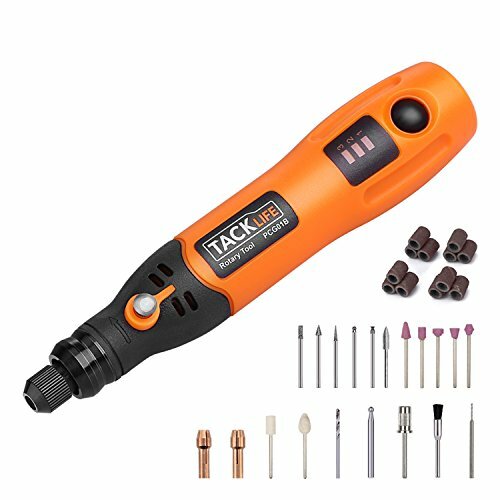 High-Performance Craft Tool - Perfect for sanding, polishing, cutting, shaping, drilling, deburring, grinding, cleaning, engraving, trimming etc, and enabling you to achieve different crafting work efficiently. Whether you are repairing home tasks or lighting your creations, this is really a worth value investment. Amazing Gift for DIY Enthusiasts - Packed in a solid carrying case. It's more solid, falling resistant and moisture-proof. Machine and accessories are well organized in, easy to place, light weight, portable for carrying. 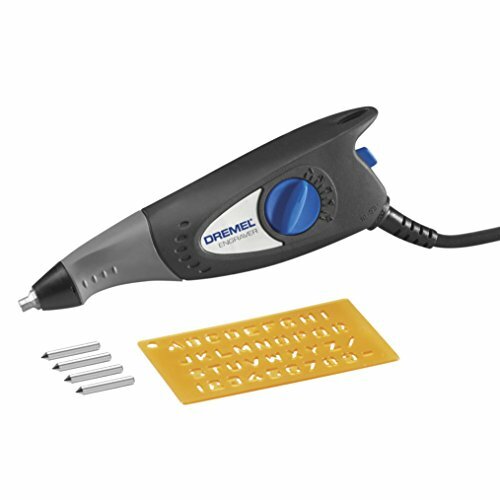 GOXAWEE Rotary Toolkit G4007 is great for the DIY craft and small family projects. It's also the gift for the people who are keen on handmade stuff. 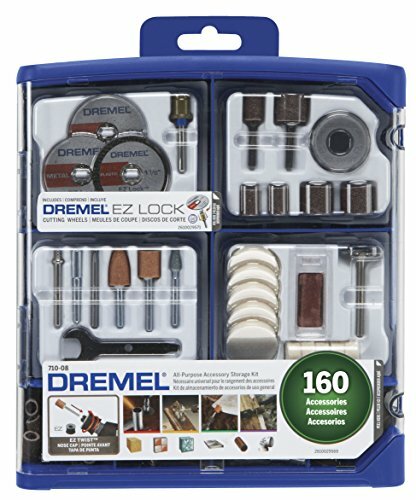 An EZ Twist nose cap wrench, EZ Lock mandrel, and EZ Lock cut-off wheels are part of this 160-piece kit filled with genuine Dremel accessories. Offering reusable storage bins and lift-out trays for easy organization of the included bits, this kit is ready for cutting, grinding, polishing, sanding, cleaning and more. 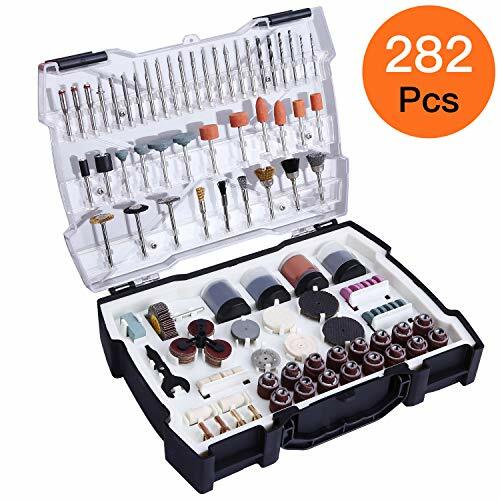 The kit also includes sanding bands, sandpaper discs, polishing compound, felt polishing wheels, aluminum oxide grinding stones, silicon carbide grinding stone, mandrels, wire brush, wrench, and a reusable carrying case with clear lid. Flex Shaft : improves level of versatility to your project capabilities. Cutting guide and Multipurpose cutting bit: hollows any shape on wood. Auxiliary Handle: makes holding more firmly, available to tackle elaborate project. Variable speed wheel located on the top lets you change the speed freely while using the tool. Lightweight build makes intricate designs to easily execute, allowing you to carve small and complex designs. (the chuck might fly if situation is serious) If used, it might lead to injury and problems in later operation like unable to hold down the spindle lock and screw tightly, or sliding. Please use the Spanner to tighten when using and DO NOT tighten the chuck too strong to lock the spindle. 2.Flex shaft:Please MUST keep the rotation speed reaching at around 2.3W( corresponding to 4 dial ) when using to avoid possible problems of great shock and hemp phenomenon if driving in low RPM. Please keep the shaft NOT be knotted or in a large angle bending. Or it will lead to increased vibration of handle and the shaft can not be used anymore. 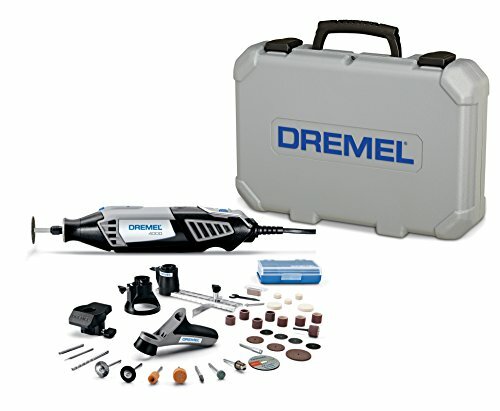 DE7700-1/15 Features: -Cordless rotary tool kit. -Two speed. -Ideal for sanding, carving and drilling. -Medium duty that goes anywhere. Generic Specifications: -7.2 V. Dimensions: Overall Height - Top to Bottom: -10 Inches. Overall Width - Side to Side: -3.3 Inches. Overall Depth - Front to Back: -6.5 Inches. Overall Product Weight: -3.1 Pounds. The Rotary Tool is a versatile tool that allows you to grind, cut, sand and drill. Remove rust on metal and get into fine detail on wood and metal with precision control. It has a powerful 1 Amp motor and variable speed from 8,000 - 30,000 RPM. 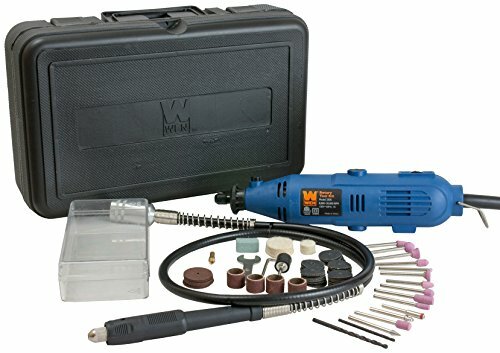 This kit includes: Variable Speed Rotary Tool, Bit Changing Wrench, 2 Felt Polishing Wheels, 2 High Speed Cutters, 10 Grinding Stones, 54 Sanding Discs, 1 Dressing Stone, 20 Cut-Off Wheels, 4 Sander Bands, 1 Drum Sander, 2 Mandrels, 2 Drill Bits, 2 Collets. 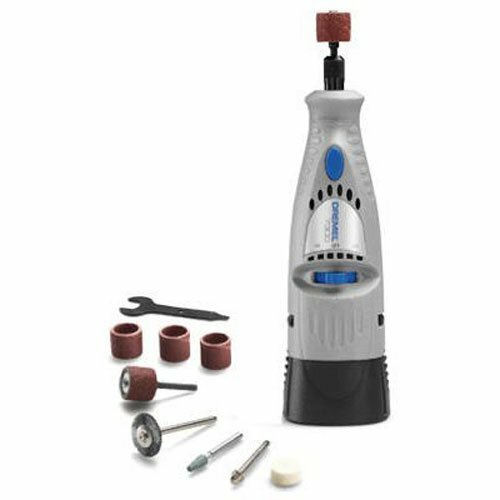 3.7 Volts of power is ideal for polishing,drilling and graving of Arts and crafts. Full charging time is about 2 hours and can be used about 90 minutes. 7.16 inches, 0.17 pounds fits nicely in the hand and does the specific job. Perfect for making cute little christmas gifts for family and friends. We warmly recommed to read manual before using and donnot put the spindle lock while operating. The 290-05 kit contains the 290-01 tool + additional accessories. A durable and compact design for your rugged jobs. Change between bits fast & easily without a wrench. For safety & ease, the tool features a turn-on/bump-off switch allowing you to easily shut tool off. The slim package packs a punch with a 5.0 Amp, 30,000 rpm motor providing more cutting power. Designed for prolonged use, the switch is dust-sealed protecting against dust ingestion. 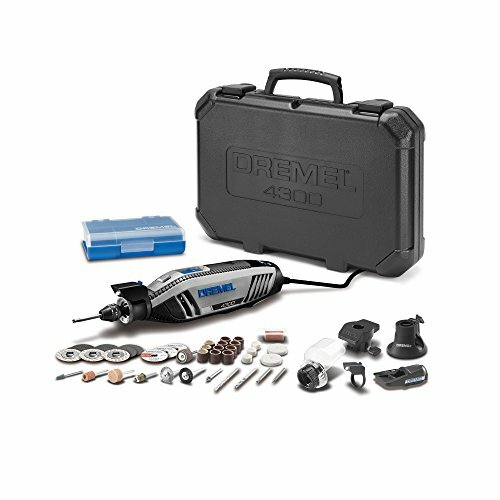 With surprising power that lets you cut metal with ease, the Dremel Micro is the perfect combination of size, ergonomics and power that make it the ultimate tool for both precise and light duty DIY tasks. 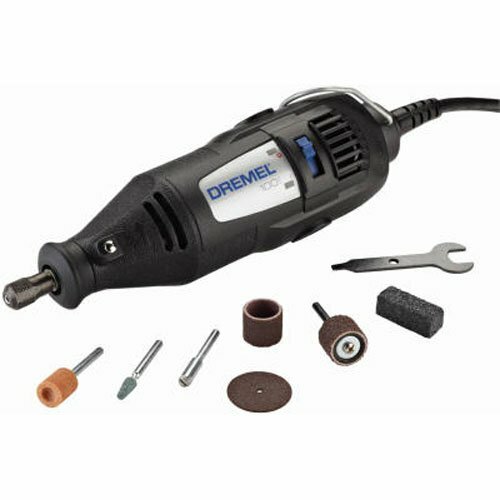 Designed to be held between the thumb and forefinger like a pencil, the Dremel Micro allows a grip that is close to the work-piece for superior maneuverability and control. 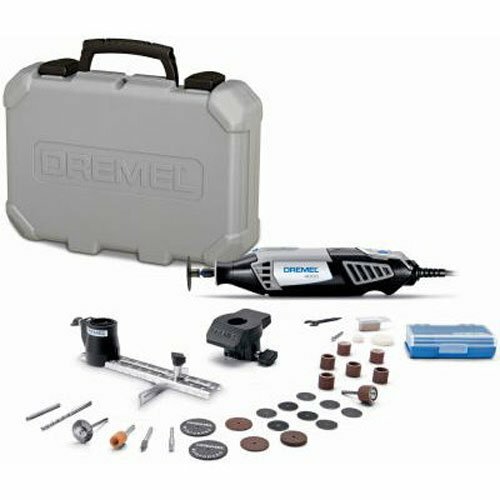 The Dremel Micro is powered by an integrated high capacity 8V lithium-ion battery for longer run time with no memory effect. 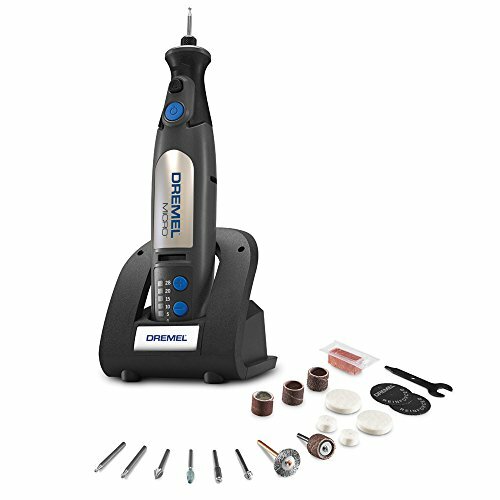 Optimal speed control on the Dremel Micro is especially user-friendly. The speed is adjusted in five stages from 5,000 to 25,000 rpm by using two buttons on the top of the tool, which enables it to be adapted to each application. A five-stage LED scale makes it quick and easy to see which speed is currently set. To illuminate projects, the Dremel Micro has LED lights built uniquely into the nose cap to aid in vision and accuracy. 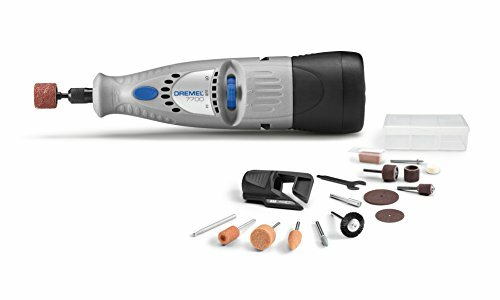 The brilliantly powerful Dremel Micro features lights that indicate battery level, lithium ion battery technology, and a docking station that automatically stops charging when the batteries have reached capacity. 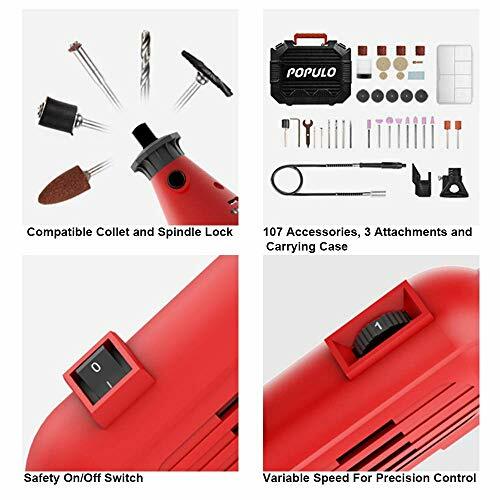 The Populo RTK-107 Variable Speed Rotary Tool Kit offers a high performance and versatile tool that includes 107 Accessories, 3 Attachments, and Durable Carrying Case. 107 Accessory Kit includes a variety of bits, discs, wheels, etc. Plus with its 3 attachments it gives you the flexibility and control you need. 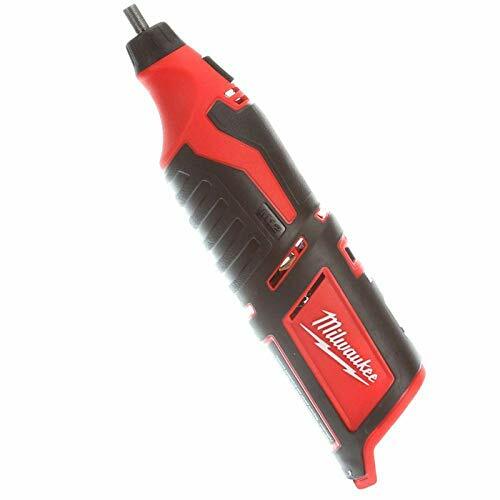 With its adjustable speed of 10,000-32,000 rpm, this rotary tool provides enough precision to complete at the widest range of DIY craft projects/home improvement. Includes 3 attachments and a massive 107 Accessories with bits, discs, wheels and More. Perfect for sanding, cutting, polishing, grinding, carve, engraving, sharpening and drilling etc. For home improvement projects and DIY crafting ideas. 3.5ft Flex shaft attached with comfortable pen grip for precision grinding, polishing and engraving. The Cutting Guide helps to adjust cutting depth up to 3/4. Sharpening Attachment with grindstone great for sharpening lawn mower blade, garden shovel or shears., etc. Variable Speed 10,000-32,000 rpm suitable for different applications, On/Off Switch increased safety operation. Spindle Lock for changing accessory quickly and easily, Universal collet selection compatible with most branded rotary tool accessories with a shank size up to 1/8 (compatible with Dremel, Tacklife accessories, etc). What's Included: Rotary Tool, 107 Accessories, Accessory Box, 3 Attachments (Flex Shaft, Cutting Guide, Sharpening Attachment), User Manual, and Carrying Case. M12 rotary tool only. The product is easy to use. The product is durable. The product is manufactured in china. Lightweight, single speed tool with ball bearing construction allow for cool running, quiet, smooth operation. Specs cord length 6', speed 35, 000 RPM, voltage 120 AC/50-60 Hz. Includes mandrel, coarse 1/2", sanding drum, dressing stone, heavy duty Emery cut off wheel, 1/2" 120 grit sanding band, aluminum Oxide grinding Stone, silicon carbide grinding Stone. 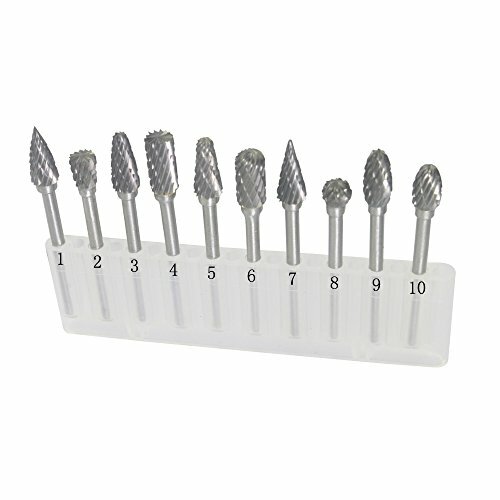 If you're a DIY enthusiast or hobby and craft fan give your rotary tool even more functionality with this set of diamond burrs.